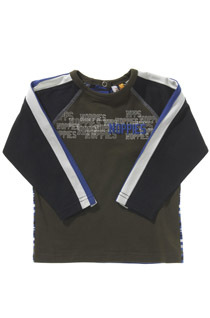 Layering him up in the cooler months is easy with the Noppies line. Take this versatile long-sleeved T. Meant for boys on the go in the traditional "boy" colours: olive with black, blue and white contrast details on the raglan sleeve. Check out the matching pant!